“Still In Love With You” is a highly apt title for the most comprehensive Philip Lynott exhibition ever launched. Lynott is best known as the founder, singer and bassist of Thin Lizzy, who’s original life span was ’69 through ’83. The band has reunited a few times over the decades with new members, and are actually touring this year. The presentation purposely coincides with the 25 year mark of the tragic passing of Lynott, at the age of 36, from complications of drug abuse. For full impact, the spread just had to be located in Lynott’s hometown of Dublin, Ireland. (He grew up in the suburb of Crumlin.) The exhibit is situated on the top floor of Stephen’s Green Shopping Centre, on Grafton Street. This is the city’s most well known street, located in the heart of the city. Philo, as he was affectionately called by many, hung out around this area aplenty. He worked on many song ideas at the sprawling and old time Bewely’s Cafe, which opened in ‘27. It’s still there and looks even more attractive inside than ever after a renovation in ‘04. Presented by Hot Press, a magazine and book publishing house, the exhibition is absolutely fantastic. It includes memorabilia, photographs, song lyrics, basses and guitars, paintings, tributes, video installations, record covers, gold discs and more. Editor Niall Stokes, who founded the magazine in ’77, gave a touching speech just before the exhibit was unveiled. The exclusive opening night, held on March 4th, was attended by many key people. 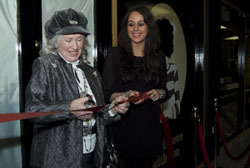 The most valuable person, so to speak, was Phillip’s adoring 81 year old mother, Philomena Lynott. It was she that cut the ribbon that preceded the opening of the door to the spacious area that contains the exhibit. (As seen in the accompanying photo.) It was also Philomena that was the most visibly proud and moved by the proceedings. Of course, much of the content was provided by her. Among the other notables that were in attendance were original Lizzy drummer Brian Downey, original band manager Terry O’Neill, original tour manager Frank Murray, and the great artist Jim Fitzpatrick, who was close with Phil and was responsible for designing most of the band’s very creative and memorable record covers. Lynott and Thin Lizzy are the biggest “classic rock” era rock band to hail from Ireland, and Lynott is the country’s most dynamic and recognizable true rock star from this milieu. In 2005, validation of Lynott’s esteemed status was made clear when a bronze statue of him, on Harry Street just off Grafton, was realized. He’s standing elegantly in a full length coat next to his black, Fender Precision bass. As special as the statue is, to see the actual bass in the exhibit, along with so many other personal items of Philo’s, is far more compelling. Everything from photos and writings that span his entire lifetime are on display. The collection offers a sublime pastiche for any fan of this celebrated, charismatic and talented front man, and should not be missed if Dublin is reasonably accessible. The bass was the right instrument for Phillip, for it has a considerably longer neck than a guitar to match his very long, thin legs. It’s also the “bottom line” of a band, as Phil was to Lizzy. The classic black Fender that Phil used most has a mirrored pick guard, which he would aim at the stage spotlights to reflect light into the band’s loyal and charged audience. He especially liked to aim the beams at the females that he fancied. This time around though, the illumination is squarely on the man himself. Philo, may you rest in peace as you live on with us forever.